This nectar-like brew, right, made with dried apricots, is adapted from Michael van Straten's Super Hot: Drinks for Health and Vitality (Mitchell Beazley). According to Michael, apricots are a wonderfully healthy fruit and are much prized by the Hunza, a legendarily healthy people who live in the Himalayas. "Their fitness, vitality, and longevity are attributed to their consumption of fresh and dried apricots," he says, before spelling out exactly what makes the fruit so good for you. "They offer a perfect balance of instant and slow-release energy, and are a huge source of vitality-boosting betacarotene, essential for a healthy immune system, good skin and eyesight." 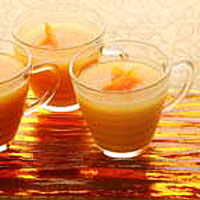 To make this tasty apricot drink, slice 12 ready-to-eat dried apricots into slivers. Reserve six pieces, and put the rest into a saucepan, cover with 500ml cold water and add a whole cinnamon stick. Bring to the boil and simmer gently for 15 minutes. Remove the cinnamon and leave to cool slightly before liquidising until smooth. Reheat and serve with the reserved apricot pieces on top. Serves 2.